Creative professional with 4+ years of experience in branding, graphic, digital, print, and web design. Guest Speaker of Adobe Editorial Design Live Streaming event. 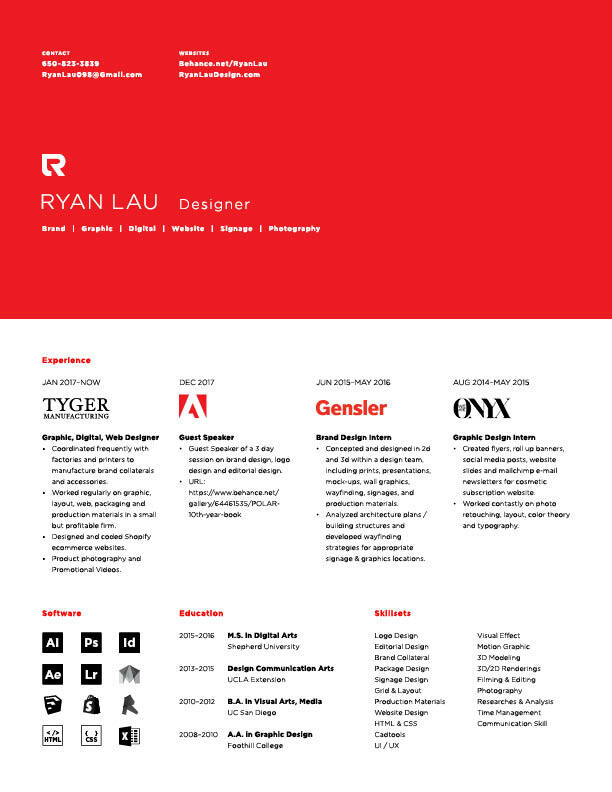 Ryan Lau is a passionate digital art major graduate student with knowledge of brand design, package design, environmental design and signage design and experience of serving at Worldwide Design firm. Coordinated frequently with factories and printers to manufacture brand collaterals and accessories. Worked regularly on graphic, layout, web, packaging and production materials in a small but profitable firm. Designed and coded Shopify ecommerce websites. Product photography and Promotional Videos. Guest Speaker of a 3 day session on brand design, logo design and editorial design. Translated conceptual and creative thinking into design solutions in 2d and 3d forms, including prints, packaging, digital deliverables, and environmental applications. Analyzed architecture plans and building structure to develop long-term and community-growth strategies for appropriate signage locations, including interior, exterior and parking lot. Designed newsletters, roll-up banners, postcards, website banners, social media posts, and website redesign. Created templates for newsletter emails on MailChimp. Online magazine publishing through Amazon Seller Central. Rebranded companies’ logo, packaging, and website. Provided brand style guides for clients’ future design reference.